This is such an uniformed political (i.e Tory) inspired statement. I am one of these long sufferring commuters (from Earlswood – with no trains today at all!) but i at least I have the intelligence to realise that the cause of this dispute is an arbitrary change in working conditions imposed by GTR purely to improve the divident payout for shareholders. GTR have a franchise to run a Govt public service nothing else. Runing a public service as per their contract should be their only objective, their shareholders profit isn’t a franchise objective. In this they are clearly failing. I for one do not want driver only trains – you only have to travel on Thameslink for the last 10 years to realise what a terrible service this separate franchise (with driver only operation) provides. So get off your political soapbox and blame the Company with the franchise – they should be “carrying employees with them” not threatening them with loss of roles. Our Conservative MP’s are are silent…of course they! I’m a fellow Earlswood commuter but actually have the other view. Having fallen victim of the frequently cancelled 07.18 I find myself getting earlier and earlier trains in the morning to be able to get to work when I need to. And on the way home sit on a train at Victoria that’s waiting for a delayed guard to get in. I’d rather be spending more time at home. Not sure this is actually a political (i.e. Tory) thing as you put it…the new trains that are being rolled onto our were actually ordered when Labour were in control of the government and transport policy. The specification that was approved, and is what we’re getting now in the form of the new Thameslink trains never had the buttons for the conductor to close the doors. They were always intended to be Driver Operation Only. Here’s what Southern said in one of their recent statements (can’d find the original but Uckfield News ran it). Finally, also worth noting that GTR don’t have a franchise, they have a management contract, they don’t have the freedom to manage the railway they’re operating they just do what the Department For Transport tell them to do. You really have shown that you have no idea at all of the workings of any railway, and of the Southern in particular by that statement. It nothing at all to do with the ‘honour’ of pushing a button, and everything to do with YOUR safety. I suggest you read, in detail the report from the R.A.I.B on the accident at Hayes, where a woman was dragged along the platform, especially the recommendations. Of course, if you are happy for a driver, confined to his can, to oversee the closing of doors, where, on a curved platform, he can not see more than two of three coaches of a 12 car train, then I hope that you will accept the liability if and when YOU are involved in a similar incident. You will no doubt bleat that the driver can see the whole train on the CCTV screen next to the stopping point of his cab, but the CCTV is so poor that the pictures make little more sense than Deputy Dawg cartoons, and often the screens are completely un-useable, because of dirt, reflections, sunlight directly onto the screen, screens not working etc etc (the list of faults is endless). Whilst I accept that all Unions will defend their position, in this case, passenger safety is also a major consideration, and should by one of YOUR considerations as well. Despite most people thinking to the contrary, the train guard, conductor call him or her what you will, has always been in charge of the train, the driver being considered having enough to do driving the thing. You, and your organisation should be reviewing your stance on this, and looking much more closely at the safety aspects. And no, I have no axe to grind for either the Southern, the Union, or anyone else. Just an old, retired, consultant engineer, with an interest in railways, and a background in engineering, and engineering insurance! The CCTV cameras are actually mounted to the train, and the monitors for viewing the output are in the cab. Because the train bends around the bendy platform he actually gets the best view of the doors – where a guard or conductor will have to step off and walk onto the platform to see around the curve. Southern published details here: http://www.southernrailway.com/southern/news/independent-rail-safety-body-concludes-no-increased-risk-from-driver-only-operation/ Along with a video showing the view the driver sees (which I’ve embedded below). 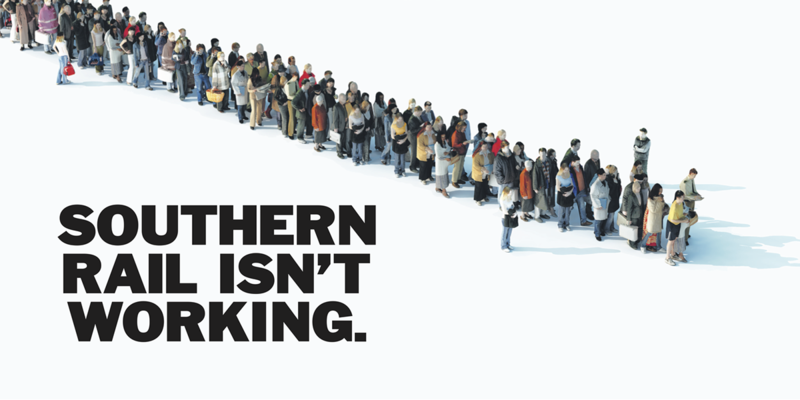 A significant portion trains on the southern network already operate in this way. The rolling stock that serves the ‘Redhill Route’ area already has this on board. Next time you board a train look up at the end of the coach for the cameras. Months of delays, cancellations and overcrowded trains: living near a Southern Rail station is a nightmare. But next year, we could be forced to pay even more for a failing service. Can you sign the petition now and ask that Southern Rail passengers don’t face a hike in fares?